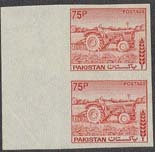 3030 ND PAKISTAN (1978) Tractor*. Grain*. Imperforate margin pair. Scott No 478, Yvert No 470. Slight crease in margin.